A properly maintained air conditioning system can help keep you comfortable on hot summer days. Did you know that a properly functioning A/C system is also instrumental in helping to defrost your windshield on those cold, damp winter days as well? A properly functioning A/C system helps to dehumidify the air passing through the defrosting system enabling your windows to quickly clear and stay fog free. If your car's air conditioning system does not seem to be operating as efficiently as it once did, let us perform a full system performance check for you. We can test the system, find the leaks, and recharge the system so you get the proper operation you deserve. Let Triple T Tire inspect your vehicle's air conditioning today. Your car or light truck’s air filter is critical in keeping unwanted, engine damaging dirt and debris out of your engine. What you may not know, is that a dirty, plugged air filter can cause big problems with power and fuel efficiency. Your air filter should be checked at least every 12 months or 12,000 miles. At Triple T Tire, we check it at every oil change and recommend it when replacement is necessary. A vehicle alignment brings the car's suspension into the proper vehicle manufacturer's specification by adjusting components so that the wheels are aligned with each other and the road surface. A proper alignment squares the car's wheels and axles with each other so that they are moving in the same direction. Each vehicle's manufacturer designates standard angles for the alignment, specified in degrees which provide improved handling and performances as well as maximizing tire tread life. Triple T Tire offers state of the art alignment equipment. Most people know that it is the battery that allows your vehicle to be started when it is not running. Many people are not aware that once your car is running, it is your alternator that takes care of running all of the systems on your car that require electricity. This includes your headlights, heating/air conditioning system, and your car audio just to name a few. The alternator is responsible for keeping the battery charged, so it is always ready to start the vehicle after it has been shut off. If your alternator fails, the battery’s reserve power will quickly be depleted causing your car to die or fail to start after it has been turned off. Items such as a broken pulley, a loose belt, or broken and corroded wiring can also cause the charging system not to function properly. If you suspect a problem with your starting or charging system, have Triple T Tire test and service it today. Your battery supplies the electrical service to start your car when it is not running. It also serves as a reserve capacitor to protect sensitive electronics on your car from voltage spikes originating from the alternator. A bad battery will usually cause your car not to start, but in extreme failures, it can cause your car to die on the road. Extreme weather conditions such as heat or freezing cold temperatures can cause a weak battery to fail. Have your battery tested to check its performance. If the results indicate your battery is in need of replacement, Triple T Tire can quickly provide a suitable replacement. Your vehicle’s belts and hoses play a critical role in the proper operation of your cooling system, air conditioning system, charging system and more. Old hoses can become cracked and dry rotted, causing them to squeal or break. Radiator and heater hoses will deteriorate with age and can get hard and crack or become soft and porous leading to system leakage and severe engine problems like overheating. A broken belt can lead to loss of power steering, failure to charge, or engine overheating, leaving you stranded on the road. It's important to have these components checked at least annually and replaced when needed. The typical life span of a belt or hose is seldom over 5 years. Your friends at Triple T Tire can inspect your belts and hoses and tell you if they are in need of replacement. Your brake system transmits the force you apply to the brake pedal, down hydraulic lines to the pistons in the brake calipers and wheel cylinders at your wheels. This force creates friction between the brake pads or shoes and the brake rotors or drums. This friction creates the stopping force needed to quickly and safely stop your car. If you're experiencing brake symptoms such as a squealing or grinding noise, a pulsating brake pedal, an abnormal amount of brake pedal travel, or a red brake light indicator, it is time to have your brakes checked as soon as possible. At Triple T Tire, we can quickly and professionally solve your problem and get you back on the road safely. Your car’s cooling system is designed to bring your vehicle up to operating temperature quickly while preventing it from running too hot. Your vehicle uses antifreeze to absorb heat from the engine and move it to the radiator where it can be cooled. Your water pump is tasked with creating the pressure to circulate the coolant through the hoses from the engine to the radiator. The thermostat is used to regulate the flow of the coolant from the engine to the radiator to maintain a proper operating temperature of around 190 degrees. If any of these components are not operating correctly, your car may run too cool causing poor performance and fuel economy while polluting the air around it. It may also cause the engine to run too hot and overheat causing possible severe engine damage. If you have concerns about the proper operation of your cooling system, have it inspected and serviced today at Triple T Tire. Most modern cars and light trucks have a differential. All-wheel drive vehicles need a differential between each set of wheels as well as a differential between the front and back wheels because the front wheels travel a different distance through a turn than the rear wheels. The differential transfers engine power to the wheels and adjusts to the difference in the wheel speed. The differential allows the wheels to turn at different speeds while maintaining control of the vehicle. The differential can experience heavy wear and tear. Noise coming from the differential can be a signal that your differential fluid may need serviced, or it can be a sign of worn gears and/or bearing due to regular wear and tear. Triple T Tire can quickly diagnose and correct these types of issues. The check engine lamp can signal a variety of issues. The lights you should pay close attention to are check oil/oil level low, oil pressure low, and check engine. However, if any dash lights continue to stay on after you start the engine it is time for you to contact us for an engine diagnostics service. Typically when light switches stay on in the dash it is the first sign of engine problems. Triple T Tire can run a complete engine diagnostics test and take care of your engine repairs. At Triple T Tire, we know how inconvenient a flat tire can be. Tires can lose air for many reasons including a punctured tire, a corroded rim, a leaky valve stem, or a cracked wheel. If you do experience a flat or low tire, come to a stop in a safe place as quickly as possible. If you are stranded on the roadside, turn on your flashers and raise your hood. Once you are safely situated, you can change to your spare or call for roadside assistance. Remember, driving for even a very short distance on a deflated tire will damage the tire beyond repair. Trust your friends at Triple T Tire to fix or replace a tire and get you back on the road quickly. In order to keep your vehicle running smoothly, it is important to check your fluid levels regularly. It is important to check fluids such as coolant, engine oil, brake fluid, transmission fluid, power steering fluid, and windshield washer fluid. Your car is a big investment. Checking the fluid levels and condition regularly helps safeguard against breakdown, mechanical damage, and even possible accidents. Let Triple T Tire examine and change your fluid levels today. Many of today’s cars and light trucks employ the use of all wheel drive or four wheel drive. While each manufacturer may have a different system for providing power to all four wheels, they all use some sort of differential or transfer case to get the power from front to rear and left to right. Some common symptoms of four wheel drive failure include: illuminated dash indicators, failure to lock the front and rear together, shaking and vibration or ominous sounding noises when engaged. If you think you have a problem with your four wheel or all wheel drive system, trust the experts at Triple T Tire to quickly and accurately diagnose and repair the problem. Lifting your truck, sport utility vehicle, jeep, etc. a few inches can really help in certain situations like off-road trails and can add a unique and appealing look to your vehicle. Giving your truck a small lift can help improve performance and power. Lifting your vehicle will allow you more flexibility in what you do with your vehicle. Not only can you drive on the highway like every other vehicle, a lift kit can help your vehicle perform better when driving through mud, sand and water. A suspension lift kit can raise the clearance allowing for steeper ascent or descent off road. Lift kits also allow for larger tire fitments. Come see the lift kit experts at Triple T Tire today! Your exhaust system takes the used up fuel and air charge from your engine, cleans it of its hazardous pollutants, and silences it before pushing it out the back of the vehicle. Common components of the exhaust system are the exhaust manifolds, catalytic converters, flexible sections, center pipes, exhaust resonators and mufflers. These items work in harmony to reduce noise and vibration, remove heat, and eliminate harmful emissions from the engine. If your vehicle is loud, lacks power, or has an emissions light indicating a catalytic converter problem, your exhaust system is likely the problem. The experts at Triple T Tire can quickly identify and resolve the problem in a timely, cost efficient manner. Filling your tires with nitrogen can reduce air pressure loss, reduce wheel corrosion, prevent inner liner rubber deterioration by oxidation, your tires can run cooler, resulting in increased tread life, increased fuel mileage and it helps prevent uneven tire wear. Experts in the tire industry indicate that oxidative aging is one of the primary causes of decreased tire life. Oxidative aging is caused by the diffusion of oxygen from the pressurized air cavity of the tire to the outside atmosphere. Tires that are inflated with nitrogen have a significant reduction in tire failure. Stop by Triple T Tire to discuss the many benefits of using Nitrogen in your tires. Your oil removes heat from the engine and lubricates its moving parts. Changing your vehicle’s oil routinely is one of the most important things you can do to promote long term vehicle performance. As you drive, the oil pump circulates oil into your oil filter and throughout your engine. The oil filter cleans dirt and deposits out of the oil, keeping your engine clean and protected. As time passes, the oil filter will begin to get clogged with this debris and will no longer be able to keep the oil clean for the engine. Most manufacturers recommend changing the oil between 3,000 and 5,000 miles to insure long life and maximum performance. At Triple T Tire, we understand the importance of an oil change. Many parts on your vehicle (including fluids, spark plugs, brake pads and rotors) have a limited service life and need to be serviced at pre-determined intervals. Regular preventative maintenance is likely the single most important thing you can do to keep your car running safely and efficiently. Routine services like oil changes, tire pressure checks, and scheduled inspections are a great way to keep your car running properly and catch problems before they become serious. Check your owner’s manual for detailed information on how often to inspect or replace things such as oil and filter, transmission fluid, brake fluid, coolant, power steering fluid, fuel, air and cabin filters, drive or timing belts, and more. At Triple T Tire, we have the tools and expertise to properly service your vehicle on a regular basis. Your vehicle’s steering and suspension are designed to create maximum traction between your tires and the road. This provides steering stability, proper handling, and good comfort. These components are ground zero at connecting your vehicle to the harsh roads and are thus prone to wearing out or even breaking, possibly leaving you stranded. Steering and suspension systems are key safety components and should be inspected annually or if you are experiencing problems such as uneven tire wear, excessive noise vibration or bouncing, loss of contact with the road, or have symptoms of the vehicle not wanting to track straight down the road. If you need your suspension checked, let the qualified technicians at Triple T Tire quickly identify any problems you may have. When your car rolls down the road, it is imperative that your tires be in proper balance. Out of balance tires will wear quicker and possibly cause symptoms such as vibration or a shaking sensation in the seat or steering wheel. These symptoms may become more or less obvious as the speed of the vehicle changes. As the tires wear, it is normal for the tires to become out of balance. It is recommended that tires be balanced every 15,000 miles to ensure maximum tire life and smooth, quiet operation. The tire professionals at Triple T Tire can quickly and affordably care for all of your tire needs. Tires are no longer just rubber and oil. Instead, they are made up of several layers of materials, each playing its own role in how the tire functions. Today's tires last longer and are less prone to dangerous blowouts than older tires. They are also better at maintaining contact with the road and can even help a car's performance. Choosing the right tires has drastically changed over the years. As an example a vehicle towing heavy weight will need a high load rating tire. If a vehicle is driven in an area with heavy rain or snow, you might prefer the purchase tires with a better traction rating, the life expectancy of a tire depends on road conditions, driving habits, usage and the type of tire. Your tires need to be changed at the very least every 6 years. The rubber in the tires dries out over time. This can lead to cracking, greater stress on the tire's infrastructure and catastrophic failure. A great drive starts with properly installed tires! At Triple T Tire we have professionally trained staff on hand to provide the best tires and tire installation in the industry. Your tire pressure monitoring system, often referred to as TPMS, is an electronic system designed to monitor the air pressure in your tires. This system uses real time tire pressure information to alert you if there is a tire pressure problem. If your tire pressure drops to an unsafe level, it will alert you via a light or warning message. Many systems will also tell you which tire is low. Low tire pressure is not only a safety issue, but it will also drastically shorten the life of a tire. Tire pressure sensors are powered by a non serviceable battery and will eventually fail due to low battery voltage. The average lifespan of a tire pressure sensor is 7 to 9 years. It's also recommended that sensors be replaced or properly serviced when new tires are installed. At Triple T Tire we have the tools, equipment, training and knowledge to properly service or diagnose your Tire Pressure Monitoring System. We would be happy to handle all of your tire service needs today. While you drive, your tires wear at different rates due to steering. The most notable wear occurs on the front tires. Regular tire rotation can keep the wear on your tires even, improving fuel economy, ensuring proper handling, and extending the life of your tires. Depending on the vehicle, your tires should be rotated every 6,000 to 10,000 miles. The tire experts at Triple T Tire can quickly and professionally rotate your tires at your convenience. Your tires connect you directly to the road surface and are the single most important safety item on your vehicle. Today’s tires are designed specifically for certain types of vehicles, road conditions, and weather conditions. Advancements in technology have also created tires that last longer, stop faster and run more quietly than ever before. Newer all season tires can provide good all around weather traction. However, if you spend a lot of time driving in slippery winter conditions, a good snow tire can make a very noticeable improvement in handling. As a tire wears, its ability to provide traction in wet or slippery conditions diminishes accordingly. When a tire reaches less than 3/32 of an inch of tread, it should be replaced for safety reasons. Tires should also be replaced if they have severe uneven tread wear, cuts, cracks or bulges on the side walls, have been run flat or are more than six years old. Quality tires can make your drive time safer and more enjoyable. Have the tire experts at Triple T Tire explain your tire options today. Today’s transmissions are both better and more complex than ever before. They are electronically shifted and computerized to produce better fuel economy, smoother shifting, and more reliability. They are so sophisticated that they have become fully integrated into the engine performance system. These advancements in technology have made properly diagnosing and servicing transmissions more important and complex than ever. While maintenance schedules for transmission fluids have been greatly extended, failure to follow them can be a very costly mistake. Many driving symptoms today are caused by problems that are not easy to identify. Proper analysis of the entire powertrain system is necessary to make sure the proper component is isolated and repaired. 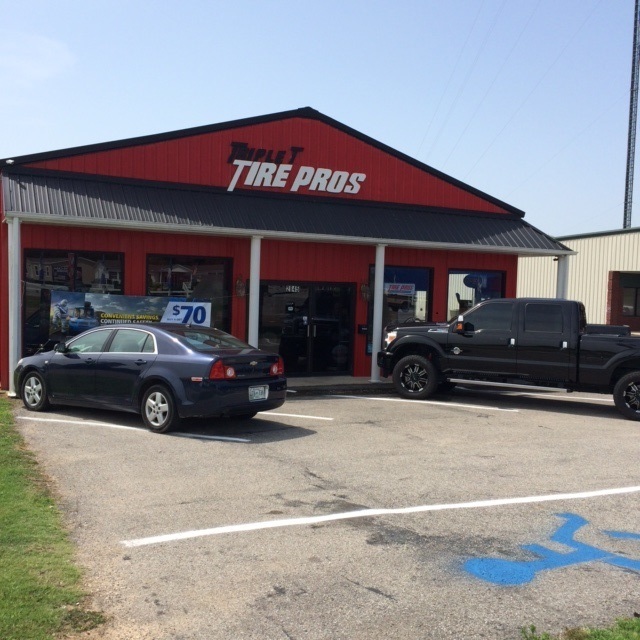 At Triple T Tire in Dyersburg and Paris, TN, we have the OEM quality diagnostic tools, along with properly trained, experienced technicians, that are qualified to get the job done right. If you are having a problem with the way your car or light truck shifts or performs, let us get you back on the road quickly and affordably. As recently as the early 1990’s, a car’s engine required consistent maintenance on a few basic components. Things like spark plugs, distributor points and condensers, valve adjustments, timing adjustments, and carburetor adjustments were needed on an annual basis. It was this qualified need that prompted the industry to coin the phrase “tune up”. Today a tune up refers to just about any combination of events that cause a car to run poorly. Items such as distributorless ignition, computerized engine controls, and fuel injection have completely changed the needs of the modern car. Things like advances in spark plug technology, and the improved efficiency of the combustion system, have increased the time between basic engine maintenance services drastically. What used to be annually has now increased to 60,000 or even 90,000 mile increments. While things like spark plugs, filters and fluids still need to be replaced at regular intervals to keep your car running problem free, most other components are now likely to last the life of the car. If your car is running poorly or has a warning indicator on the dash, trust the pros at Triple T Tire in Dyersburg and Paris, TN to pinpoint the problem. We have the tools, equipment and trained experienced technicians to solve the problem quickly and efficiently. It may not be evident to you that your car is developing a costly problem, until it is too late. Annual maintenance and visual inspections are your first line of defense in finding problems early. Regular vehicle inspections have the potential to save you hundreds, or even thousands, on costly repairs in the future. If you are concerned about the safety and road worthiness of your car or light truck, schedule a maintenance inspection today at Triple T Tire. The process of aligning wheels on a car involves adjusting the wheels so they roll straight and are true to the center line of the vehicle. Misaligned vehicles will exhibit accelerated tire wear along with other possible concerns like a crooked steering wheel, pulling to the left or right, or a condition of wondering down the road without tracking straight. Tires that are left out of alignment will wear rapidly and may also develop a wear pattern that makes them excessively noisy while rolling down the road. Your tires are a big investment and your most important factor in traction and braking ability. Protect them by keeping your vehicle properly aligned at Triple T Tire. Your wiper blades are critical in helping to remove rain, snow, and debris from your windshield. Over time, the tiny rubber wiping edges will harden and crack, or rip and tear, causing them to perform poorly at the most crucial times. In cold winter climates, most wiper blades will need to be replaced at least yearly to maintain proper wiper operation. Stop by today for quality, budget friendly wiper blade replacement at Triple T Tire. 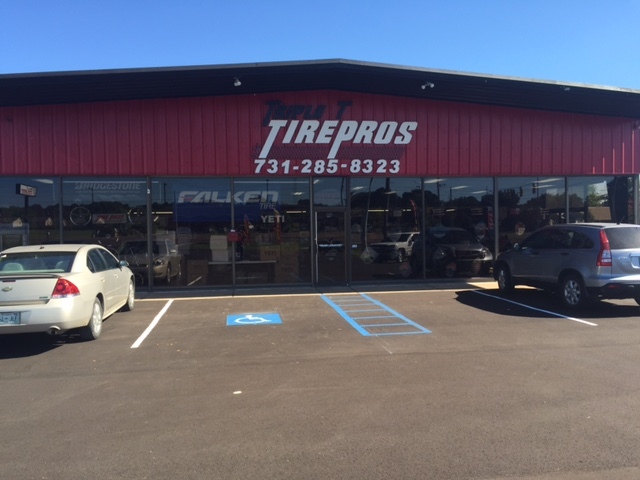 Triple T Tire in Paris TN and Dyersburg, TN is a leader in offering name brand tires, wheels, auto repair and brake services. Our well-trained staff specializes in the sale and installation of all tires, including passenger car, performance, light truck or SUV tires. Are you ready for a fresh new look for your vehicle? Custom wheels and rims are also available at Triple T Tire. We also offer complete under-car services, such as oil changes, brakes, shocks, struts, alignment, and transmission service. Triple T Tire provides these services for both foreign and domestic vehicles, and offer them at competitive prices. Please Browse through our website or Call Us at one of our 3 Locations, West Dyersburg: (731) 287-0333. North Dyersburg: (731) 285-8323. Paris (731)642-0313. Triple T Tire offers name brand tires at affordable prices for your car. We offer brands such as Michelin, BFGoodrich, Uniroyal, Bridgestone, Firestone, Goodyear and many others. 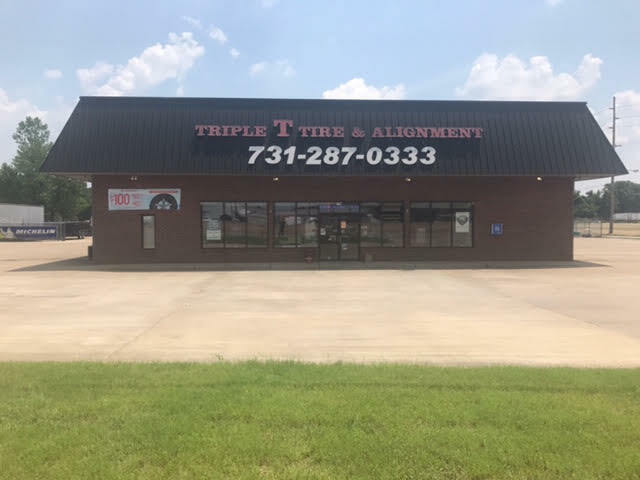 Triple T Tire also specializes in a full line of services for your automobile, such as brakes, alignments, oil changes, tune ups and much, much more. Please give us a Call Today or Click Here to schedule an appointment. 3 great locations ready to serve you in Tennessee. Find the location nearest you!